This year's exercises were delayed by about a month for the Winter Olympics and to help create conditions for a resumption of talks between North and South Korea. A combined field training of South Korean and USA troops got under way Sunday as scheduled, defense officials said amid a nascent peace mood on the divided peninsula. The computer-simulated Key Resolve exercise will begin in mid-April and last for about two weeks, officials said. The Foal Eagle drill started the same day as a historic concert by South Korean pop stars in Pyongyang, which will be staged late Sunday as a peace gesture ahead of inter-Korea summit in March. As opposed to the past when Seoul deliberately publicized the US strategic assets approaching the peninsula for the exercises, local military sources said the Defense Ministry will try to keep the exercises low-key this year in order to not provoke North Korea, which has promised to halt all missile and nuclear testing during the period of talks. In announcing the dates last month, Pentagon spokesman Marine Lt. Col. Christopher Logan insisted the exercises are "defense-oriented and there is no reason for North Korea to view them as a provocation". 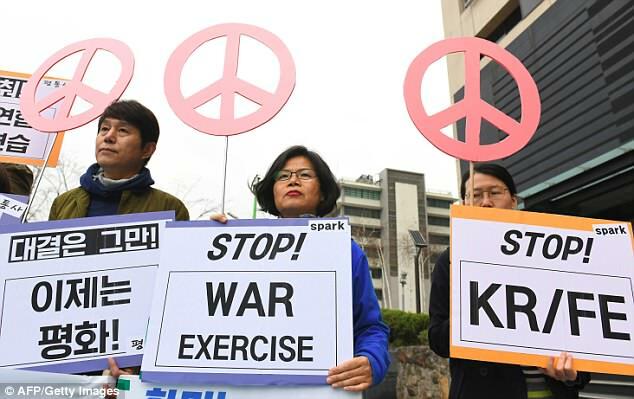 A number of South Korean protesters held up signs denouncing the military exercises on Sunday. The U.S. and South Korea have resumed joint military exercises after halting the drills during the 2018 Winter Olympic Games. But military officials say the period of the drills will be halved to about one month, and there are now no plans to include United States aircraft carriers or bombers. The detente followed months of heightened tensions as Trump traded threats and personal insults with Kim, calling him "little rocket man" and threatening to unleash "fire and fury" and to "totally destroy North Korea" if needed to defend the United States and its allies. In a meeting last week with Chinese President Xi Jinping in Beijing, Kim expressed his willingness to discuss North Korea's potential de-nuclearization.